A slew of new books reveals much about the recent history and current state of the British left. The age of insecurity has turned out to be one of rage and anger. Yet, so far, a near decade of economic collapse, turmoil and corporate deception hasn’t led to a widespread revival in the fortunes of the left’s ideas and popularity. Instead, the picture is very mixed. There has been a rise in populism, xenophobia and identity politics: Trump and the US Republicans, UKIP and the French Front National, and the much more sinister hard-right examples in Poland and Hungary. There has been the emergence of a revivalist left in places (Bernie Sanders, Jeremy Corbyn) and a new populist one (Syriza, Podemos). But nowhere, apart from Greece – that hasn’t worked out too well – has a popular left entered government challenging the economic and geo-political straightjacket. It is this backdrop which makes David Aaronovitch’s ‘Party Animals: My Family and Other Communists’ more than an esoteric, idiosyncratic read, but one which has some relevance in the midst of the emergence of Corbynmania. 'My mother and father were communists' memories are obviously a declining heritage industry but Alexi Sayle recently contributed to this genre with a typically more light-hearted read. He affectionately reviewed Aaronovitch’s book and made common cause (both having one Jewish and one non-Jewish communist parent) about the surreal nature of the party parallel universe (the party dentists, plumbers and accountants, often irrespective of their skill). the broad left conceit: of demanding that you are either for ‘us’ or against ‘us’.Sayle’s take produced a small stream of letters in The Guardian complaining about, and blaming, left self-criticism and division for many failures of the left. They also alleged that because Aaronovitch and Sayle had been hard on the left, they were somehow giving the green light to unfettered free market capitalism. They also touched a recurring theme: of anger from Guardian readers at the paper’s continual criticism of the obvious limits of the Corbyn leadership, which point to the broad left conceit: of demanding that you are either for ‘us’ or against ‘us’. Aaronovitch’s book is a part-biography, part a short history of the failure of British communism. It begins with his memory of Yuri Gagarin coming to Britain in 1961 when communism seemed briefly to represent ‘the people of the future’. It was but one of several brief and false dawns which also comprised Stalingrad and Sputnik. It has more sadness and elegy in it than anger or comedy, aided by the story of his parents, Sam and Lavender. His father became a party full-time organiser, portrayed in Doris Lessing’s ‘The Golden Notebook’, and did the typically communist thing of writing a book about economic development in Kenya without ever visiting the country. He later became an academic economist and even had an influence way beyond ‘the party’, being one of the main advocates of what became Labour’s Alternative Economic Strategy (AES) in the Bennite highpoint, which formed the backdrop of the 1983 election manifesto, but that is left unexplored. The backdrop to Aaronovitch’s story is his parents’ unhappy marriage, his father’s long-term affair, David’s distance from his father and the secrets central to his upbringing, which ranged from deeply personal to political and from the party to psychoanalysis. This is quite a rich tapestry for any author to make sense of about their own life, and probably with all due respect, beyond the confines of one book. Moscow Gold? The Soviet Union and the British Left by Paul Anderson and Kevin Davey charts the ill-fated story of the Communist Party of Great Britain (CPGB) which existed from 1920-91, and what happened to its personnel and politics, post-Soviet Union breakup. The ‘Moscow Gold’ of its title refers to the now incontrovertible fact that until the end of the CPGB, Soviet authorities massively underwrote and subsidised the whole adventure to the extent that it tarnished and brought into question every campaign and position the party took. Anderson and Davey are two knowledgeable writers of the left, its fractures and many evasions, but what makes this account valuable is its changing fortunes. They write that when the peace movement was a mass force in Britain in the early 1980s, the old lefties of the CPGB and various Stalinist hues were irrelevant (leaving aside the bitter Eurocommunist vs Stalinist battle in the party). But by the start of the 21st century, CND and the peace movement were a pale imitation, and because of this, these old left forces, now in the form of the Socialist Worker’s Party (SWP), its Stop the War inspired coalition, and assorted Stalinists, came to the fore, through their ever-presentism and ability to organise. This has left the left with a leadership of people who haven’t changed many fundamental opinions in the last forty yearsThis has left the left with a leadership of people who haven’t changed many fundamental opinions in the last forty years as the world has been characterised by huge convulsions and upheavals. In Britain, this has seen Jeremy Corbyn’s office being made up since his election as Labour leader by a host of old left-wingers, some experienced such as Simon Fletcher (previously Ken Livingstone’s chief of staff and who worked for Ed Miliband) and others who have little to no experience such as former Guardian columnist Seumas Milne. 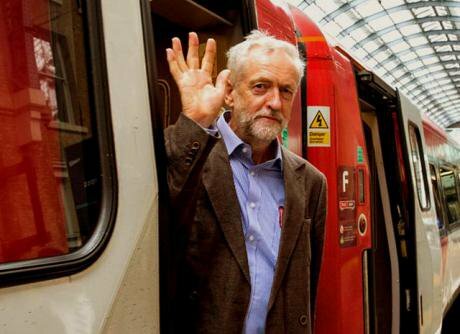 Rosa Prince’s ‘Comrade Corbyn: A Very Unlikely Coup: How Jeremy Corbyn stormed to the Labour Leadership’ is a decent exploration of the public face of the new Labour leader. He remains in this account, elusive and distant, a very private man, and one of very few public statements and pronouncements, beyond repeating the same slogans and clichés on numerous platforms. She doesn’t have any real feel for the minutiae of left culture, divisions and numerous sects, but then one wouldn’t expect that from a former staffer of the Telegraph. The book does come alive in its latter stages on the mini-revolt that was the Labour leadership contest which saw Corbyn win his unexpected landslide, to the complete bewilderment of the other candidates and party establishment. She is also quietly assertive on Corbyn’s pronouncements on the IRA and Ireland, judging him completely irrelevant to the peace process. Corbyn has kept the same political positions since he first became political in late adolescence: a politics of, if not permanent revolution, then what Aaronovitch would call ever-present ‘militant voluntarism’, the belief that just by continually turning up one would eventually change the world. He calls this, "a sort of far-left version of ‘The Sound of Music’: climb every mountain, ford every stream, attend every demo, until you reach your dream" (The Times, February 13th 2016). This is in effect the E.H. Carr big question of history as asked in his book ‘What is History?’ Describing a traffic fatality, he asks who or what was responsible for the multiple factors. Aaronovitch takes this as a cue to summarise how the Corbyn car crash happened and asks: "was it the fags, the booze or the brakes?" I think we will find in retrospect it was all of these – along with Blair, Brown and Miliband (David and Ed). The Corbyn book is an illuminating counterpoint to the biography of Mohammad Sarwar, Labour MP for Glasgow Govan (then Central) 1997-2010 and governor of the Pakistani province of Punjab. This authorised account, written by Bob Wylie (ex-Militant official, now adviser to Frank McAveety, Glasgow City Council leader) glosses over all the really big questions and controversies, from what are Sarwar’s politics and principles, to what really happened in years of party infighting. Underneath this a more subtle story could have been explored with much wider resonance. Sarwar’s election in 1997 was the culmination of decades of campaigning by local activists such as Stuart Petrie to achieve Muslim representation in Labour in Glasgow. When the bitter party infighting began, as Sarwar attempted and ultimately succeeded in defeating sitting MP Mike Watson, the likes of former communist and UCS shop steward Jimmy Reid added their voice to Sarwar’s cause. it ends up in the cul-de-sac of supporting identity politics as the expression of progressive values, only to find it justifying the worst kind of conservative, elder male politicsThe unexplored question is what kind of politics did the likes of Petrie and Reid end up giving succour to? What sort of politics beyond tokenistic identity politics did they think they were championing? Isn’t it possible that this is what happens to the left after it loses much of its raison d'être, namely, that it ends up in the cul-de-sac of supporting identity politics as the expression of progressive values, only to find it justifying the worst kind of conservative, elder male politics? Many might think this cautionary tale is in the past, and irrelevant today, but it isn’t. There is the SNP’s ‘Big Tent’ identity politics, which have proven enormously popular in recent years, but as they get more and more popular they seem increasingly shorn of anything worthy of the description ‘progressive’. SNP former minister Mike Russell in a Herald review saw Sarwar as having "a passion for justice and peace" and contributing to "an important global debate" (The Herald, January 16th 2016). At the same time, Anas Sarwar is attempting a political comeback to the Scottish Parliament in May (top of the Glasgow Labour list), and openly positioning himself for the Labour leadership at some point in the future. So all of the above can be seen as rather relevant to political pitfalls and representation now. Former Salmond supporter and now arch SNP critic Tom Gallagher makes this point in ‘Scotland Now: A Warning to the World’ and while he does go over the top, there is truth in the limits of identity and populist politics. Fascinatingly, the book contains a foreword from Alistair Darling, previously head of ‘Better Together’ who writes that if Nationalists call this process a journey, then, "If ever there was a case for believing it is better to travel in hope than to arrive this is it." The book contains a rich resource of revealing quotes from evangelical Yessers such as Pat Kane commenting to composer James MacMillan, "we are now the new modern establishment". Or Alan Bissett writing, "The summer of 2014 – dare we call it the Summer of Independence? – could be for Scotland what 1967 was to London and San Francisco". The latter is filled with the exuberance of the moment, but the former reflects the positioning of self-interest which happens in every society, but is never a pretty sight. The left in Britain have historically never understood that it has the culture, ethos and mindset of a tribe, and a closed tribe at that, which puts up near-impenetrable barriers to people who are outwith it. This has become a politics of faith, of religious belief and dogma, and one equivalent to a church. Martin Kettle who, like Aaronovitch and Sayle, grew up with communist parents wrote recently: "The left does seem happiest as a fellowship of true believers, squabbling among itself, dismissive of all those who remain sceptics or whose beliefs the elders find unacceptable" (The Guardian, January 22nd 2016). This is a politics of closed-minded dogma, of clinging to the wreckage while all around the world is changing. It is one which doesn’t adapt, change, evolve, live and learn, but instead clings to certainty and what it sees as eternal truths, and eventually because of that, slowly declines, becomes irrelevant and falls by the wayside. This is what passes for a large part of the British left these days, the Corbyn phenomenon and many of the left sects outside the Labour party. But there are also warning signs for Scottish nationalism too and the pursuit of identity politics tied with populism and progressivism. Some in Scotland seem immune to the mixed picture of the SNP in office, and want to ignore the disjuncture between talking left and acting centrist or on occasions right-wing. Radical politics in Scotland post-indyref aren’t in a dramatically different state from the rest of the West, or immune to the same challenges and choices. The limits of a politics of true faith can most obviously be seen in the last real and powerful dogma standing, not that of the left, but of corporate crony capitalism. A different kind of radical politics would recognise that the left’s conservatism, inability to challenge its own totems, and its clinging to dogmas, have all contributed to its failure and the triumph of the Alice in Wonderland politics and economics we see before us. A common strand running through Aaronovitch and a number of these accounts is to question the ultimate purpose of the left and what kind of world it wants. Ultimately in Britain and its four nations this has to entail a republic of equal, valued and respected citizens, based on openness, democracy and little tolerance for elites and vested interests, wherever they come from. The track record of too much of the British (and indeed Scottish) left has been appallingly selective, cautious and ambivalent on this, to the dire cost of its political fortunes. Sadly, despite everything, in 2016, these are home truths which too many on the left still choose to willfully ignore.